We have been so happy with the 2014's litter* of Nuga and Prince that we decided to give them another go:-) but this time the litter will be born and raised in Finland at kennel Rajaköörin. *check out Nugas and Prince's "mystic litter" for lots of pictures of their big sisters and brothers. My first Bernese Mountain dog I had when I was twelve (1989) and since that almost always I've had at least two of these big lovely friends around. I've even tried to live without them but without success:-) I first bred Berneses in Finnish Lapland together with my mum, with the name "Rajaköörin", but life and love took me to Italy (or maybe it was food;-), and our first "Ghiro Tondo" (still Rajaköörin) litter was born 2013. 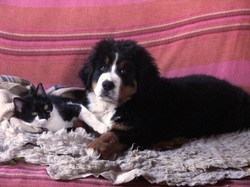 In Bernese I love their character which at their best is sweet, kind, open, soft, affectionate and easygoing. They are real darlings with children, welcome all guests (probably even thieves) and get along well with other animals as well. They are funny and have a sense of humor too, stubborn, and intelligent enough to pretend to be stupid! Also being an artist (of life!) they please my eyes for their magnificent beauty. Many people say they love breeding Berneses also because they are challenging (they have many health related problems and rather short life-expectancy). This challenge has inspired me to find more natural ways of keeping and breeding dogs, and even challenging the challenge it-self -maybe I was just doing it wrong, maybe it's not supposed to be so difficult! Now with a new more "down to earth" kind of way to see breeding, (and all life), it all seams much less difficult (knocking wood:)). Our Berneses live free like all our animals (of course to the point that anyway they are safe), and are part of the family. They play with children, are friends with our farm animals, and also do some work with sheep and cows. They eat meat & bones, plus yogurt, whey, eggs, and leftovers from the Italian chef's kitchen. We would need a lot of convincing before to give Bernese puppies to apartments, and would not give them to anyone who keeps dogs most of the time alone, caged or chained. My wish is to breed happy, healthy and harmonious dogs, for people who love dogs for the company, positive energy and feeling they give. I respect the origins of the breeds and hope they would be sound and fit enough to still perform their original tasks in the terrains they were born and have the potential to live long healthy life's. When it comes to beauty I value more dogs that move well and are sound and balanced, of excellent type but not exaggerated. If our puppies grow to beautiful show-dogs, that's just great, if not, but they are happy, we are happy the same. I also believe that the diversity within the breed makes possible the continuation of this hobby without facing too many health issues. Of course beauty, brains and good health can fit into the same dog, but putting beauty first unfortunately often means by-all-means thriving for success in competition and fame, without collaboration, and this often leads into overlooking health, natural qualities and good character. I know because I have done it too. And I've lost too many dogs for cancer etc. when they were much too young. There is infinitely much more to learn about genetics, and about the influence of nutrition and environment as well when it comes to breeding dogs. I am very curious about this all, and the well-being of the individual dog and the whole breed are my inspiration. I don't know if I'll ever succeed to make this breed healthier, but I'll damn well give it my best shot! And luckily there are many other breeders that have a similar motivation.